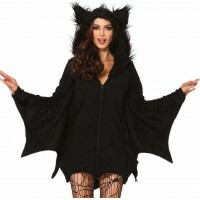 Have fun this Halloween as a bat in this fun adult womens costume. This 2 piece Black Magic Bat costume has a wet look lace catsuit with lace wing sleeves and comes with the matching head band. Other items shown sold separately. Item Number: LA-c85540 | Approximate Size (Inches): 10.00 wide x 2.00 deep x 14.00 high | Approximate Shipping Weight: 2.00 lbs. US Standard Shipping Ships direct from the manufacturers warehouse in California via FedEx Ground. Street address required for delivery. Average transit time: 1-4 days. US Express Shipping Ships direct from the manufacturers warehouse in California via FedEx Standard Next Day Air. Street address required for delivery. Average transit time: 1-2 days. International Delivery Ships from manufacturer in California to our warehouse in Florida (4 days) then to you via US Priority Mail. Delivery times vary depending on destination country and customs - average 10 days. Express shipping is available to some countries - contact us for details. PO Box/APO/Military Delivery Ships from the manufacturer in California to our warehouse in Florida. Ships to you US Priority Mail usually within 5-10 business days. Average transit time: 4-10 business days. Delivery time varies with delivery country and customs.